Attention to Al Gore is getting in the way of climate change adaptations. What people ask you when you’re on a climate-change book tour. There are almost three times as many believers in climate change as there are deniers. Let’s talk about that instead of talking about Al Gore. People keep asking me about Al Gore. I wrote a book, Windfall, about who will profit from climate change. On book tour and in advance of the latest bleak report from the Intergovernmental Panel on Climate Change, I’ve been traveling around the country talking about our warmer future. I can’t shake him. Isn’t Al Gore responsible for the issue’s divisiveness? Isn’t Al Gore the one profiting the most off global warming? Isn’t it funny that Al Gore lives in a big house, not a cave? Isn’t climate change a religion, and Al Gore its wannabe Pope? 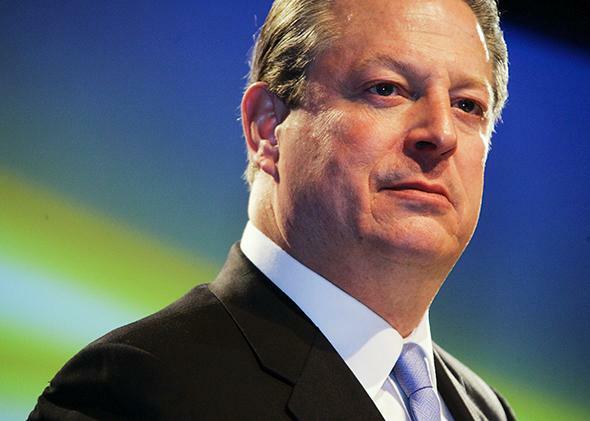 Am I for Al Gore or against Al Gore? Here, for the public record, is my Al Gore story: Several years ago, I was at the Loews Regency Hotel on Park Avenue in Manhattan, having breakfast with a hedge-fund manager who had partnered with the son of the most feared general in South Sudan to lease a giant patch of that country’s farmland. The lease area was about a million acres—nearly the size of Delaware. The logic of the South Sudan deal, which was announced after the so-called global food crisis in 2008, was that given factors including population growth and climate change, in the long term the price of food could only go up. The value of farmland could only go up. It was becoming the ultimate asset class. If you could get land for cheap in a place like South Sudan—relatively empty thanks to its wars, relatively water-rich thanks to the Nile—you could presumably plant on it or simply sit on it and someday make a fortune. As global temperatures rose, deals like this were taking place all across Africa. As Americans debated whether climate change was real, or talked about Al Gore, or simply didn’t talk about the global climate at all, Arab states, Chinese firms, and major investment banks snapped up farmland in Cambodia, Brazil, and Ukraine. That’s it. My Al Gore story. I don’t think about him much. So why does everybody else? Perhaps because his name is a code word. Climate change denial is at a high point in this country. According to a November survey by the Yale Project on Climate Change Communication, 23 percent of Americans actively disbelieve that it is happening. A related finding is that among skeptics, greater understanding of climate science does not lead to greater acceptance of it. Quite the opposite: It allows for easier cherry picking. It hardens denial. Which means that no amount of charts or stats or forced viewings of An Inconvenient Truth are going to move the dial. The binary conversation we keep having around global warming—pro versus con, consensus versus conspiracy, liberal vs. conservative, Gore vs. Inhofe—isn’t a conversation. It’s a culture war. It’s abortion. It’s Benghazi. It’s about something other than the facts or even the details. So what if we just stopped trying to have it? What if we focused instead on the majority opinion in the Yale survey? There are almost three times as many believers as there are deniers, and not many of them spend their days trying to convince the holdouts. The key character in my Al Gore story, of course, is the guy I was sitting with in the dining room, the farmland investor who sidestepped the supposed debate on climate change to focus on the bottom line: What could a warmer world mean for me and mine? An Inconvenient Truth came out during the George W. Bush administration. We now have a Democrat in the White House—not Al Gore, but a different winner of the popular vote and the Nobel Prize. Hardly anyone has been asking me about him. But Barack Obama has lately given us grounds for a very different climate conversation. Meeting on Valentine’s Day with farmers and ranchers in Fresno, Calif. in the midst of a winter of weather extremes on a day when 91.6 percent of the state faced severe drought, he announced a new $1 billion “climate resilience fund” to help communities predict and prepare for the impacts of global warming. He pledged a separate $1.2 billion in more immediate aid to California and other agricultural states suffering from the weird weather. This came soon after the administration’s announcement of seven regional “climate hubs” meant to help farmers and rural communities adapt to the changing climate. It came soon before Obama’s proposal to change the way we finance firefighting. As wildfires become more prevalent and destructive in the desiccating West, he wants Congress to treat the worst of them like other federally declared disasters, like Hurricane Sandy, eligible for emergency funds in excess of the annual budget. President Obama is embracing what is known as adaptation: building ourselves a lifeboat, not just trying to stop the flood. Adaptation is more politically palatable than U.N. treaties or carbon taxes, not to mention more politically realistic in today’s Washington, D.C. If the president approves the Keystone XL pipeline even as the EPA begins to regulate carbon emissions from coal-fired power plants, the turn toward adaptation may prove to be the least ambiguous part of his climate legacy. And if this is where the country is going, isn’t this what we should be discussing? In case I’m wrong, here’s some red meat: You’ll want to know that the place in New York City where Al Gore often breakfasts is also where John Edwards first met Rielle Hunter. Another morning I was there with the farmland investor, we saw Nancy Pelosi, then Al Sharpton. And get this: The lattes cost $9. The investor ordered one (skim milk), so I ordered one, too (whole milk). He’s a libertarian, and I’m, you know, an impartial journalist, but we totally sipped them. This is really beside the point, but the $9 lattes where Al Gore eats breakfast aren’t even any good. In case I’m right: Let me start the discussion we should be having with an obvious point that 97 percent of climate scientists can surely confirm. Cutting carbon emissions is more or less democratic—it helps lower the temperature of the global climate, not merely one’s own patch—but adaptation is not automatically so. We surely need to do both; by now adaptation is inevitable because some amount of temperature rise is unavoidable. But we need also remember that just as some people can afford to buy up someone else’s farmland, some people and some countries and some neighborhoods can afford better lifeboats. And if we adapt badly, global warming’s most important split will not be between those who believe and those who do not. It will be between those who are rich and planning ahead and those who are poor and can’t afford to.